The main ticket gates will be open from midday on Friday 3rd August and the entertainment will commence from approximately 14.30pm. Music on Saturday and Sunday will start at midday. The campsite will close on Monday the 6th and everyone will need to be off site by midday. Please note traffic on and off-site is limited to the hours of 8am – 10pm. No traffic, bar emergency and service vehicles are to enter the site between the hours of 10pm and 8am. Green/Local Pledge/No one use plastics! We are privileged to have such an amazing site and surroundings to host the party in, we don’t want to ruin it, in fact we want to put as much effort as we can back into looking after it. We will be working closely with the local council, our neighbours and emergency services to provide the best possible party for both the locals and the travelling partygoers. We aim to source local produce and utilise local services where possible. We’re very aware of Together’s beautiful surroundings and we’re constantly looking for ways to reduce impact on the environment - eco toilets, eco spa, reusing your cups, compostable packaging and using local suppliers and services where possible. This year we are going a step further to reduce plastic on site, we’re banning plastic straws and non-compostable plastic cups. There will be a 10p (compostable) plastic cup tax if you don’t have your own cup. We hope you are all behind this decision. 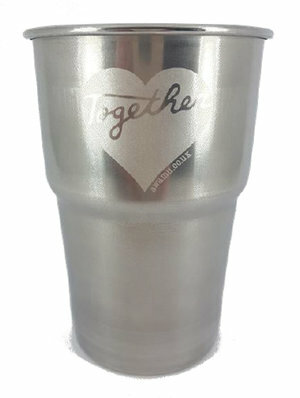 You can bring your own cup or order one of our beautiful steel Together cups that you can use again and again on site and for years afterwards. Lots of you have told us cold drinks taste better in them, they keep your pint colder for longer, are made from 90% recycled steel, support skills, jobs and industry in Sheffield. Buy cups for collection on arrival here. Recycling and rubbish facilities will be provided on the campsite and we would appreciate your support and commitment to keeping the site clean whilst enjoying the party. Please do not bring glass on site and remember to take as much of your rubbish with you - leave no trace! We welcome children and have lots going on for little people. Read more about what we have planned here. Don't forget your tiger feet for safari disco! Parents please note: children must be accompanied by an adult at all times on site. Please be aware that the party is happening on a working farm, it’s a home to horses and, whilst we will do our best to keep the great outdoors a safe place for us all, there is machinery and potential hazards around - please don't get were you shouldn't and keep your eyes peeled! Is there a dressing up theme? Of course! We know you lot love and excuse to dress up. This years theme is: To be announced soon! There are lots of workshops lots of awesome workshops for all ages happening over the weekend - disco yoga, meditation, mindfulness, poetry, crafts and flossing. Check the programme of events for timings. Eat, drink and feel merry because you'll be helping to change lives! At Together we are trying to cover our costs and raise money for some very deserving kids in the slums of Kampala. The bars and cafe are on of the main ways we will raise money for this life changing work, so please visit them as much as possible and don’t bring loads of your own booze please. You've got to eat, and you got to eat well! We've searched high and low to bring you a selection of the finest food known to humanity! Crust Conductor are returning with the best wood fired pizza known to man. Asian Grub Foundation will be preparing Punjabi street food made with fresh local produce - masala egg tacos for Breakfast and chicken, lamb or vegetarian (and Vegan) wraps and samosas served with delicious chutney’s. Ganders Goat will be cooling us down with their Artisan goats milk ice cream. The Awamu cafe will be serving classics - homemade cakes, crumpets, teas and coffees (steaming hot or iced cold! ), fresh fruit, cocktails, and lots of other delicious treats. We will have a fabulous bar offering a selection of your favourite tipples at very reasonable prices from chilled bottles of bubbly to a fabulous selection of ales and ciders. Due to the fire risk caused by this heat wave, we have to put a total ban on open fires, fire pits and instant BBQs/any BBQ's that are at ground level. We are allowing trolley grills (i.e. proper bbq’s raised on legs) and request that you douse the ground beneath it before you light it. They must never be left unattended, and the embers must be extinguished as soon as you have finished cooking, please have sufficient water to hand to put it out. The campsite has fire lanes and exits for your safety. If we see a fire we will insist you put it out, if you refuse you may be asked to leave as you are putting others in danger. Fire is a serious concern for us and for your own safety, and everyone else's, please respect the ban. Together welcomes all. Please note the party is taking place on a farm and therefore the ground is uneven and can be tricky to navigate even when sober. There will be an accessible toilet on site and we can reserve parking if you let us know in advance. We offer a carer ticket to attendees in receipt of Disability Living Allowance (DLA)/Personal Independence Payment (PIP). We ask that you buy your tickets directly from us in advance by contacting Emma. Please, please, please respect our neighbours! If you’re a night owl and want to stay up late, please camp as far away from the houses that run along one side of the camping field as possible (a map will be provided on site and the campsite sign posted for family camping, quiet camping and night owls). Make use of the barn in the early hours, it's open until 4am, will be full of lots of cosy areas to sit with your friends. You won’t be alone there! Phone charging will be available at the Awamu Tea Barn for a small donation. Tickets for Together are available to purchase via Billetto here. You will be emailed your tickets with your confirmation from Billetto. Please print them out and bring them with you! If you have not received a confirmation email, please contact the Billetto team on support@billetto.co.uk and they will make sure you get it. Because we are sharing our beautiful site with friendly horses there are no pets are allowed on the party site. There will be plenty of parking for all party goers. No Vehicles can be brought to the campsite field, unless through prior arrangement with the organisers. There is a very short walk from the car park field to the camping field. If you are planning to bring a live-in vehicle you will need to buy a ticket here. Our site is just an hour and twenty minutes drive from London, set on a farm in a beautiful valley amongst the Chiltern hills. We'll send you address, directions and travel advice nearer the time. Event security will be allowed to search tents if they have reason to believe that any of the Together party clauses have been breached. We will not be liable to party goers in any circumstances for any property damage or theft or personal belonging lefts in tents. We have a no drugs policy and reserve the right to eject anyone suspected of taking illegal substances or infringement of this policy. Our eviction policy also includes the use of nitrous oxide and tagging. We welcome all ages to the festival. However, there are entry restrictions. Anyone 16 and under must be accompanied by a ticket holder over 18 years old at all times. ID may be required upon entry to the event. Please bring your original documents as you won't be able to use a photocopied version. If you don’t have any of these, or don’t want to lose valuable documents onsite, we suggest that you apply for a PASS approved ID, some of which are free to get. We believe that everyone has the right to enjoy themselves safely and consensually in a space free from all forms of discrimination, bullying, harassment or judgement. Which is why we have adopted NEST – a set of social guidelines. NEST is like a "social insurance policy" - something we have just in case something does go a bit wonky. It’s a code of behaviours that is all about having a good time while being welcoming, safe and consensual. I agree that everyone has the right to enjoy themselves safely and consensually in a space free from all forms of discrimination, bullying, harassment or judgement. I agree to treat others respectfully, to act responsibly and to be held accountable for my own behaviour, regardless of intoxication. I understand that my words and actions may have (unintended) consequences. I respect another person’s right to identify my behaviour as unwelcome, regardless of my intentions. I agree to stop doing anything that is identified as unwelcome, if asked to do so. I understand that everyone is responsible for ensuring a positive environment, including me. I acknowledge that fear of “spoiling the vibe” is not an excuse for inaction, as any behaviour that warrants intervention has already spoiled the vibe for someone. I agree to assist (or find someone who can assist) anyone who is subjected to unwelcome behaviours. I agree to prioritise marginalised people’s safety over privileged people’s comfort. This means that I understand unconscious bias and power imbalances and will take these into account with regard to complaints (and if necessary, challenge counter-complaints that ignore them). The only kind of fun we're trying to stop is the kind where one person is enjoying it but the other person isn't. No one wants to have to deal with this stuff, including us. But this stuff happens, and that's no fun at all. If at any point you feel uncomfortable at Together, you can approach anyone at the Awamu Café and ask for ‘Angela’. No matter how busy the team may look, we are there to listen and help. Our first and most important action is to ensure that everyone feels safe. Please read more about the code of conduct and share and discuss with your friend and family. Ticket holders consent to video filming, photography and sound recording as members of the “audience”. The audience has no rights to these images, and agrees to the free use of these images and recordings by Together Festival Ltd or any authorised third parties in any reasonable manner without claim. We store your personal data when purchasing tickets. This data will not under any circumstances be given to any third party. We may contact you with Together related news and information.